Situated between Edfu and Aswan, Kom Ombo is the ancient city of Pa-Sebek, that is the «home of Sebek» the crocodile god who was already worshipped in pre- dynastic times. 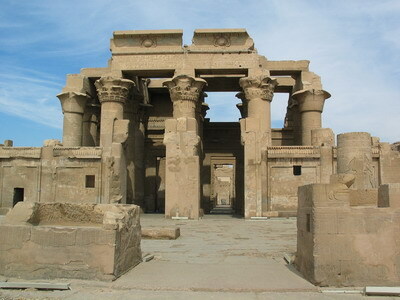 In Kom Ombo is to be found the impressive remains of a temple of somewhat unusual style. In fact it is a double temple obtained by joining two temples along one side. The right-hand temple is the one consecrated to the god Sebek, the god of fertility who is also believed to be the creator of the world, while the left-hand temple is dedicated to the god Haroeris, that is «Horus the Great» the solar god of war. 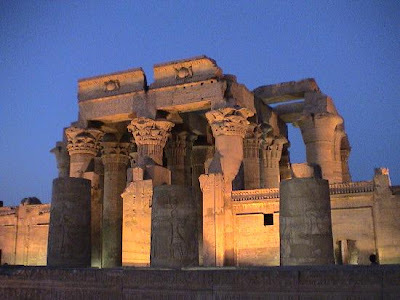 This temple was also rebuilt by the Ptolemies who adapted a temple built at the time of Tutmose III. The two temples were surrounded by a large outer wall which opened into the Nile via two gateways. In the hypostyle hall there are three rows of columns, one of which runs down the centre dividing it into two separate sanctuaries in a rather original manner. Then come the sanctuaries clearly separated by a space.